How great would it be to have your own protocol droid? He could translate over 6 million forms of communication for you, so any time you run into a tribe of Ewoks, you'd be able to tell them to NOT cook you over a fire. He could help tell you about the odds during dangerous situations, which is pretty helpful unless you're Han Solo, flying in the face of terrible odds (never tell him the odds). It's starting to sound like a pretty awesome idea, right? Unfortunately, we just don't have the technology available to make droids as smart as the ones in Star Wars, but we have a great alternative to help you out! 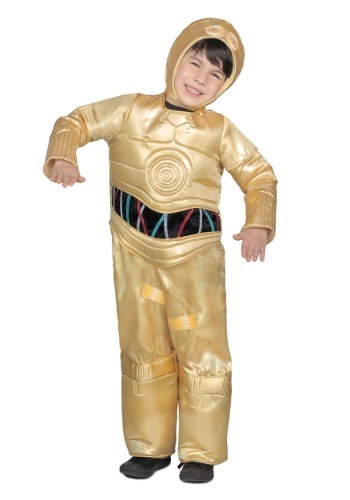 This Deluxe C-3PO Costume turns your kid into the bright gold character from the Star Wars movies! With printed features to recreate his look from the original trilogy, the kid's outfit should have no problem giving your child the iconic look. The costume even has a hood that has C-3PO's features right on the top of it, so all you need to do to make the transformation complete, is to teach your child all the forms of communication that he'll need to help you out on your journeys in a galaxy far, far away. Start brushing up on your Wookiee now! So excited to finally order it. Fits great and looks good.